Reiter & Walsh is very proud to announce that our own Rebecca Walsh has been chosen by Michigan Lawyer’s Weekly as one of the 2012 Women in the Law. 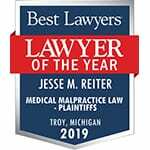 Only 20 attorneys are selected each year to receive this honor out of a large number of nominated lawyers and judges from across Michigan. Award recipients are assessed and chosen based on a number of factors including legal successes, record of giving back to the profession, and record of giving back to the community. We congratulate Rebecca Walsh on this well-deserved honor!